I was really surprised that Blair was the winner, not that I don't love her. I thought Valerie would win by a landslide, but boy was I wrong! Blair holds a special place in my heart for two reasons. The first is that my younger sister's middle name is Blair and I was the one who picked it when she was born. (Side note: We're ten years apart in age. That should explain it!) AND it is one of the first Zoyas I ever owned. I had received them as part of the Earth Day promo in 2009, with Indigo, Charla, Mimi, Colbie, and Ibiza, and have not looked back since! Although, now I'm pushing 40 Zoya polishes and they have a box of their own in my polish bin. So without further adieu, hereeeeeeeeeee's Blair! 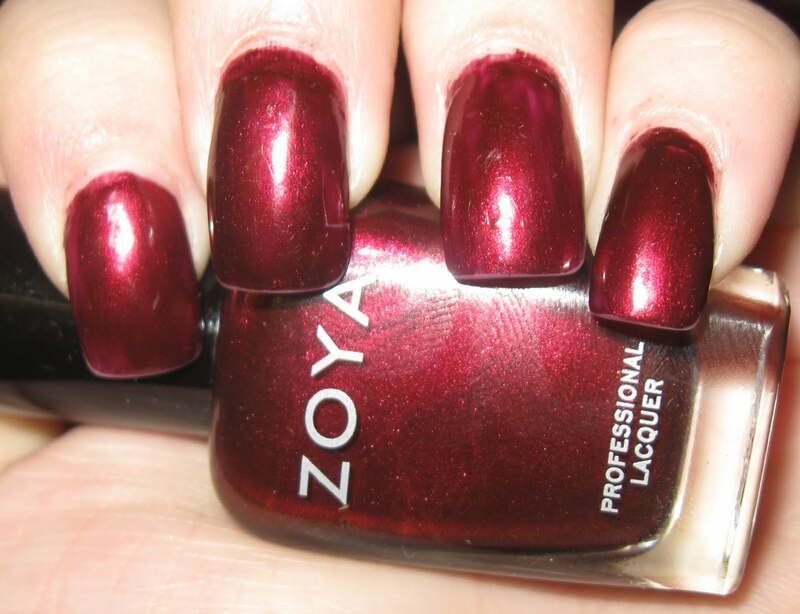 Blair is a gorgeous and rich cranberry metallic that is perfect for the upcoming holiday season. When I first received Blair, I wasn't sure it would be a color I would wear for more than a day. Turns out, Blair is very flattering for my skintone and I will likely pack it with me when I go on vacation. I've been wearing her for three days and will be sad when I have to take the shade off tomorrow. And speaking of tomorrow, since it has been so unseasonably warm here in Jersey, the theme is going to be ocean water. So vote for Charla, Indigo, Marina, or Ibiza for the Day 6! Blair is really pretty! Clearly I need to add her to my growing wishlist. Blair is a pretty color. I'm not into blue, but I pick Charla!!! Blair is really pretty! So I pick Marina so I can see a color I don't own :)Thanks!